Russian-supported rebels seized control of the Ukrainian city of Donetsk two years ago. At the time, Marina Nagornaya was a first-year student at Donetsk National University. Donetsk is a city of one million people. It is in eastern Ukraine, about 100 kilometers west of the Russian border. A majority of the people speak Russian. The Donetsk area has close cultural historical ties to Russia. Marina Nagornaya said life was quiet before the war. Donetsk gained fame as the host city for the 2012 European football championship. Two years later, Donetsk was a war zone. It was at the center of heavy fighting between Ukrainian government forces and pro-Russian separatists. By the summer of 2014, Donetsk was a war zone. Nastya Melchakovskaya was also a student in Donetsk. In April of 2014, separatists seized government buildings and declared the Donetsk Peoples’ Republic, or DPR. They announced that Donetsk was no longer part of Ukraine. At Donetsk National University, rebel fighters seized cars and two student dormitories. By late summer, it was no longer safe for students to come to class. In September, men with guns raised the flag of the DPR at the university. They demanded a pledge of allegiance from the teachers. Professors who did not support the rebels had to leave. 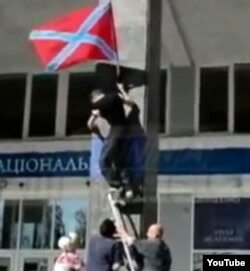 Rebels raise the DNR flag on the campus of Donetsk National University in September of 2014. Roman Gryniuk, the university’s Ukrainian rector, was forced out. Gryniuk and some sympathetic professors left Donetsk. But they did not forget about their students. They would teach them anyway — from an empty factory in Vinnytsia, 800 kilometers west of the city. Donetsk National University became a university in exile. Vinnytsia is a mid-sized city in central Ukraine. It is a three-hour train ride west of the capital, Kyiv. The university administration used space in a Soviet-era jewelry factory in the center of Vinnytsia. They had no computers, desks, or books. They had to leave behind the university’s library and student records. With help from foreign partners, local officials, and the Ukrainian government, the university set up simple classrooms. At first, only a few students made the trip west from Donetsk. Nastya Melchakovskaya was one of them. It was her first time living away from home. Roman Gryniuk returned to his position as rector. Gryniuk says the biggest problem is finding reasonably priced housing for the growing number of students. Today about 4,000 students study at the new location. In Donetsk, there were 14,000 students before the war. Back in the city of Donetsk, the original university campus continues to operate under the control of the separatists. Both campuses claim to be the only “true” Donetsk National University. In a speech in front of the main building, history professor Sergey Baryshnikov criticized the students who moved to Vinnytsia. History professor Sergey Baryshnikov served as acting rector of the rebel-held campus in 2014. History is at the heart of the information war in the current conflict. Both sides have long lists of historical grievances. For example, separatist supporters often accuse western Ukrainians of supporting the Nazis in World War II. Some pro-Ukraine activists say the rebels are trying to bring back the Soviet Union. One side’s freedom fighter is the other side’s terrorist. The 2015 school year began on time in Donetsk. Students moved back into the dormitories. Artem is a student at the Donetsk campus. He recently spoke to a reporter for Russia 24 television. "I have many relatives in the Russian Federation and in other countries abroad, I have an aunt in Germany and an aunt in Australia but I personally would like to stay in Donetsk after graduation from the University for about 5 years minimum. The war brought people closer and so the love for our country now is even stronger." 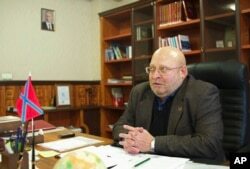 The university administration in Donetsk has brought back Russian academic standards. Ukrainian language and history classes have been cut back. The school changed its coat of arms from Ukrainian to Russian. Its website now has a Russian domain address. Some students are worried about the value of their university diplomas. Diplomas awarded by the DPR are not accepted in Ukraine or in the European Union. This year’s graduates received a second diploma from Southern Federal University in Russia. The students expect these Russian degrees to be accepted internationally. Back in Vinnytsia, Melchakovskaya and Nagornaya hope their university will move back to Donetsk someday—under Ukrainian control. But Gryniuk does not think that will happen any time soon. The United Nations says that more than 9,000 people have been killed in the conflict in eastern Ukraine since 2014. The level of violence has decreased in recent months. But the battle for young minds continues. Adam Brock reported this story from Vinnytsia, Ukraine. George Grow was the editor. 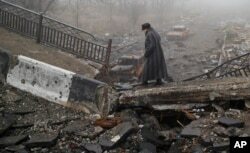 Donetsk Peoples’ Republic – n. a self-declared republic in eastern Ukraine. Russia is the only major power to recognize it as a state. pledge of allegiance – n. a promise of support or loyalty to a country or group.